This is my new favorite dinner recipe! Called, “The Six-Kid Crowdpleaser” from Dinner: a Love Story. A note on the medium: definitely use a dutch oven. Skillet to bakeware simply does not work. In an ovenproof skillet or Dutch oven , brown 3 to 4 large boneless chicken breasts over high heat in olive oil, about 2 minutes a side. Remove breasts from pan. (They do not have to be cooked through.) Turn down heat to medium-low and add one onion (finely chopped) and 2 cloves garlic (minced). 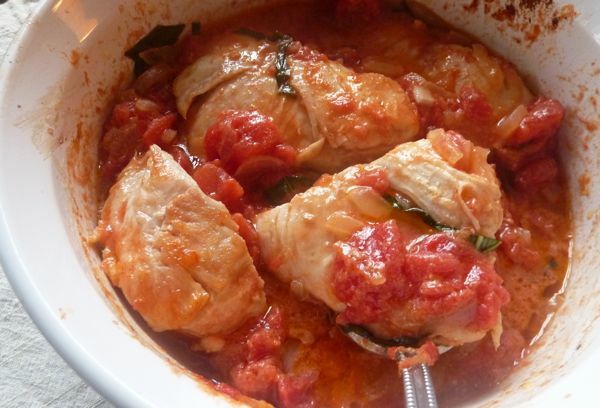 After about 2 minutes, stir in one 15-ounce can San Marzano tomatoes and simmer for 15 to 20 minutes. Stir in 3-4 tablespoons mascarpone and a handful of roughly chopped basil. Add chicken back to pan, immersing them in sauce. Bake at 350°F for 20 minutes.